Miniaturization is evident in memory card creation; over time, the physical card sizes grow smaller. PC Cards (PCMCIA) were the first commercial memory card formats (type I cards) to come out, but are now mainly used in industrial applications and to connect I/O devices such as modems. 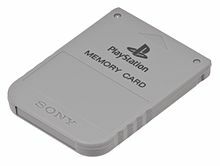 Since 1994, a number of memory card formats smaller than the PC Card arrived, the first one was CompactFlash and later SmartMedia and Miniature Card. The desire for smaller cards for cell-phones, PDAs, and compact digital cameras drove a trend that left the previous generation of "compact" cards looking big. In digital cameras SmartMedia and CompactFlash had been very successful[neutrality is disputed]. In 2001, SM alone captured 50% of the digital camera market and CF had captured the professional digital camera market. By 2005 however, SD/MMC had nearly taken over SmartMedia's spot, though not to the same level and with stiff competition coming from Memory Stick variants, as well CompactFlash. In industrial and embedded fields, even the venerable PC card (PCMCIA) memory cards still manage to maintain a niche, while in mobile phones and PDAs, the memory card has become smaller. ^ Grunin, Lori (2010-01-06). "Sony does SD; Panasonic intros first SDXC cards | 2010 CES — CNET Blogs". Ces.cnet.com. Retrieved 2013-01-07. ^ "Camera trends come into focus for 2010", msnbc, 13. January.2010 "As much as the storage-format war cleared up a bit with Sony announcing that it would support SD and SDHC cards ..."
^ "FEATURE: Playing Your Cards Right at Retail", Peter K. Burian, 4. June 2010. "Some industry observers have suggested that this development signals an end to the 'format war,' ..."
^ "SanDisk and Sony announce SxS memory card: Digital Photography Review". Dpreview.com. Retrieved 2013-01-07. ^ Pinto, Yosi. "SD + PCIe/NVMe card New Innovations in SD Cards Lead the Way to Mobile Everything" (PDF). Flash Memory Summit. ^ "The Official NEO-GEO Memory Card FAQ by Billy Pitt". www.neogeoprotos.com. Retrieved 2017-02-10.